This morning on my way into the office, I finished Marrow by Elizabeth Lesser, a powerful book that I have been listening to for the last couple of weeks. 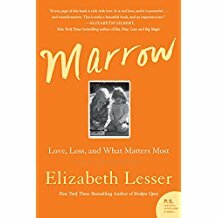 When I pulled into the parking lot of the Conference office, I sat in the car for a while soaking in the profound lessons of this visceral memoir of two sisters who find deep courage and healing through a life and death experience of a bone marrow transplant. Elizabeth, the author, is the donor and her younger sister Maggie is the recipient needing the transplant. When Elizabeth learns she is the perfect match, she not only says yes to the transplant, but also yes to a process she calls a "soul marrow" transplant. The process consists of the sisters' deep commitment to dig into their complex family history, their own complicated relationship as sisters, and come to a place of forgiveness and the reclaiming of unconditional love and grace. As is often the case with loved ones, especially siblings, there are layers of misunderstandings and misconceived assumptions that are burying their ability to be completely honest, generous and authentic with each other and with themselves. As they embark on the intentional work of digging through the ancient artifacts of their childhood, youth and young adult life, they discover that much of the residual pain and unfinished business in their relationship comes down to words that were carelessly used and abused in their relationship. Words that had the power to hurt and, in some cases as they discovered together, there had been words that destroyed important parts of themselves. As I reflected on their story, I was reminded on the incredible power of our words to hurt or heal. In the Talmud, the rabbis warn readers that words can be akin to murder, (See Tractate: Arachin 15b) for some spoken words can cause irrevocable damage. The damage that can be done by words is underscored in a Hasidic tale about a man who went through his community badmouthing and slandering his rabbi. One day, feeling remorseful because word had gotten back to the rabbi about the man's behavior, the man went to the rabbi and confessed what he had been saying. The man begged the rabbi for forgiveness and said he was willing to do penance. The rabbi told the man he had one request before he could offer forgiveness. The rabbi asked the man to take several feather pillows out into an open space, to cut them open, and watch how the feathers scatter to the winds. The man honored the rabbi's request. Yet, upon returning to the rabbi, the man discovered the rabbi had another request of him before the rabbi could offer forgiveness. The rabbi simply said, "Now go and gather all the feathers." Of course, the man protested, "But that is impossible." In response the rabbi said, "Yes, you are correct it is impossible. And though you may sincerely regret the evil you have done and truly desire to correct it, it is as impossible to repair the damage done by your words as it will be to recover the feathers." In her memoir, Lesser courageously names that sometimes there is irrevocable damage that is done by words spoken out of misunderstandings, frustrations, assumptions, fear and anger. And while there is always enough room for the offering and receiving of forgiveness and grace, the healing does not mean the scars or pain will suddenly disappear. What a powerful reminder for us that our words matter. May we use them cautiously and carefully. May we choose our words to build up rather than to tear down and destroy. And when we cannot speak the truth in love, may we remain silent until we can.